The company was established in 2000, and has it's facilities in Trøgstad, Norway. However, the experience of enginetuning and building of complete cars for own use and for others goes back to 1989. 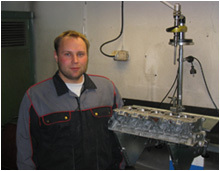 V.S Motor has wide experience in motorsports and streetcars. We have buildt engines, chassi and complete cars, both for rallycross, rally, asphaltracing, dragracing and street use. We have experimented with turbocharging since 1990 and have earned lots of knowledge. In later years we have specialized on dynotesting and enginemapping in fully computerized DTS enginedyno.